This two-acre garden is really eight different gardens in one! Enter the ancient and mysterious world of dinosaurs where you can walk through a rib cage, dig for fossils and step into footprints of the largest creatures that ever walked the Earth. See a real Space Station node (donated by Marshall Space Flight Center) and Water Rocket Clock (complete with a real missile!). Explore the world of rainbows through prisms and kaleidoscopes. 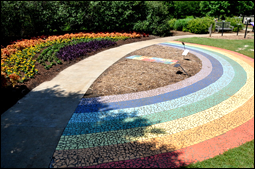 See rainbow gardens, benches and paths. And look for our pot of gold! The Storybook Garden, filled with visual references to well-known fairy tales, features toadstool seating, a pergola; a hidden garden gate, a wishing well, and a yellow brick road. 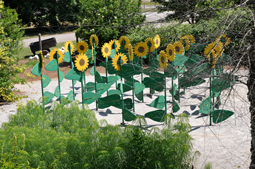 Get lost in the old-fashioned maze, or make one of your own from giant sunflowers with moveable leaves. There is also a labyrinth for fun on a smaller scale. Friends and families can call directions from the fabulous tree-house overlook. 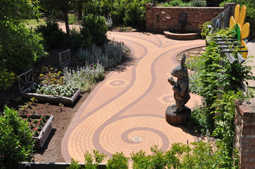 Each year the Garden picks a country to honor in the International Garden. During the year, plants from that country are highlighted in the flowerbeds. 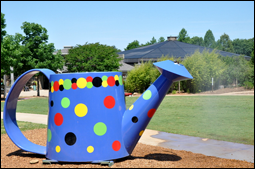 Adjacent to the International Garden are three abacuses for educational and physical fun. 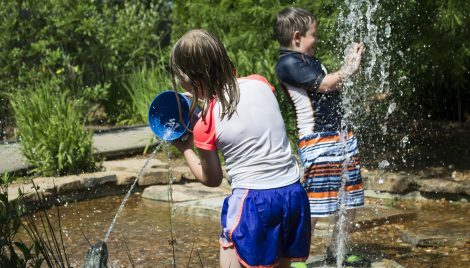 Splash around in Pollywog Bog - a wading pool to cool off on a hot day! The Bamboo Garden shows how useful bamboo can be. Musical instruments, cutting boards, pipes, fences, fishing poles and even buildings and bridges can be made from bamboo. With so many uses, it’s a good thing that bamboo grows so fast! See how many uses we have found for this flexible, yet sturdy plant. Take action in the Half-Acre Wood and discover the joy of working with your hands and getting dirt under your fingernails! Look for worms and bugs in their homes. And, just how do plants grow? Get to the bottom of that mystery at the Root View. We’ve all seen bees, but do you know how bees see us? Step up to the Bee’s Eye View. Plan a party in the Celebration Station.